These unique tools are for use after the frets have been installed, trimmed flush to the sides of the neck, and the ends uniformly beveled with a flat file. They go a step beyond our popular Fret End Dressing File, adding a single-cut toothed concave filing surface. This makes smoothing the fret ends and delicately blending them into the crown of the fret more efficient. A professional touch, and a great fix for fret ends that protrude in dry weather, too. 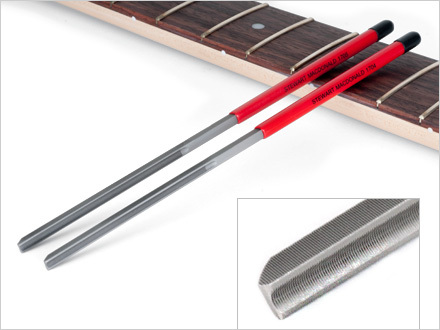 Click the button below to add the Concave Fret End File Wide Frets to your wish list.